Thus, April 5 will always be known as Jada Kenner Day. State Sen. Chris Jacobs presented the proclamation and declared the special day to Kenner on Friday afternoon during a ceremony at the North Buffalo school. Those in attendance included Kenner, her parents, her relay teammates, her track coach Dan Tryon and a handful of other school officials. The purpose of the gathering was to celebrate an athletic feat that Kenner has wrapped her head around but still can’t believe she achieved it. During the New York State Public High Schools Athletic Association track and field championships in Staten Island on March 2, Kenner didn’t just run like the wind during the 300-meter dash. She breezed to victory at the Ocean Breeze Athletic Complex – posting a winning time of 39.24 seconds. It turns out that time set a world record for 12-year-old competitors. 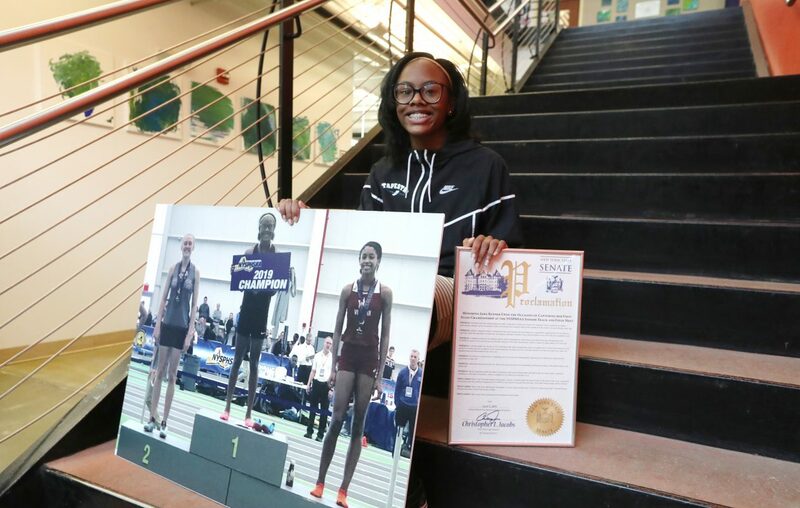 Kenner set the seventh-grader state record for fastest time in the 55-meter dash back in January when she posted a time of 7.28 seconds, breaking a mark that had stood since 1983, according to NY Milesplit. She lowered it to 7.27 during sectionals. During the state meet, Kenner along with Stevens, Alexis Johnson and Nyrelle Simpson broke the Section VI record in the 4x200, posting a time of 1:44.36 to place sixth after coming into states as a No. 11 seed. Though Kenner set an age-group world record in the 300, she just missed breaking the Section VI mark held by Orchard Park senior Jenna Crean. However, Kenner beat Crean, a past state champion committed to run at Duke, during the state race. “Running with Jenna is always good so for Jada to beat her is crazy,” said Stevens, who has crossed paths with Crean on more than one occasion during their distinguished scholastic track careers. As distinguished a career Stevens has had, the future Division I runner for Campbell University in North Carolina is amazed at what Kenner has been able to achieve as a seventh grader. The 5-foot-2 Kenner said she hadn’t participated in a sport until lacing them up and giving running a try in fourth grade. Turns out she liked the sport, a lot. Kenner said she was excited and emotional once she learned she set a world record. Receiving the proclamation Friday helped it register further that she achieved something remarkable. “It feels good. I’m very proud,” she said.